I recently watched the play ‘A Walk in the Woods’ at Delhi Theatre Festival. 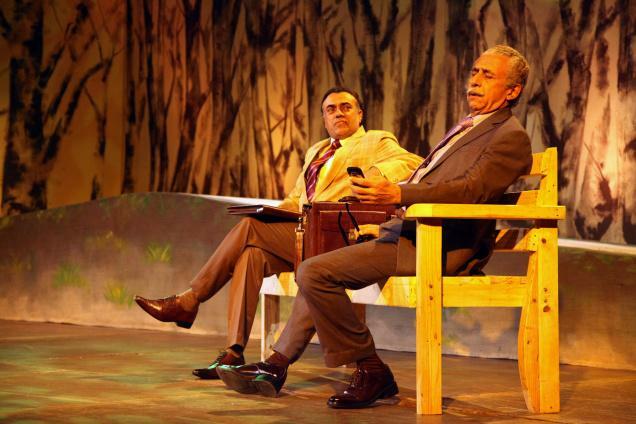 A two-hander featuring Naseeruddin Shah and Rajit Kapur , A Walk in the Woods, directed by Ratna Shah Pathak, is an adaptation of the American playwright Lee Blessing's original play of the same name. Interestingly, the Indian adaptation is done by actors Faisal Rashid and Randeep Hooda. While the original play revolved around two diplomats, an American and a Russian, trying to discuss a peace proposal towards the end of the Cold War, the Indian adaptation focuses upon two negotiators, Ram Chinappa (Rajit Kapur) and Jamaluddin Lutfullah (Naseeruddin Shah), representing Indian and Pakistan, respectively, trying to reach some sort of a peace agreement between the two countries through a series of talks in Switzerland. The play holds great relevance at a time when the ever so tenuous relationship between India and Pakistan has hit a major deadlock. Instead of trying to find a solution to the problems that have plagued the two countries since partition, the plays endeavors to highlight the countless that the two countries have lost over the years opportunities of establishing peace in the region owing to lack of trust, resolve, and perseverance. The play doesn’t opt for the easy option of accusing the enemy country (in this case, Pakistan) as the root cause of evil but rather chooses to meditate on the various factors/circumstances prevalent since partition that have undermined all the peace talks. The play begins with the two diplomats taking a stroll in the woods away from the public scrutiny. Ram Chinappa, being the younger of the two interlocutors, appears to be full of optimism. Ram has just replaced another diplomat who had earlier been engaged in a dialogue with Jamaluddin Lutfullah. While Ram is really keen on starting from where his predecessor had left, Jamal seems least interested in starting any official peace dialogue. He, on the contrary, seems more interested in frivolous affairs. He is really keen on making friends with Ram. Jamal is willing to go to any extent to strike a friendship with his counterpart but Ram insists on keeping their association strictly professional in nature. Jamal is an old timer and understands full well that these peace talks are little more than just a formality. Over the years he has seen many such discussions fail owing to various reasons. Jamal’s cynicism slowly becomes more and more obvious. But, Ram is committed to the task assigned to him and is in no mood to waste his time on the frivolous discussions the Jamal seems interested in. While Shah’s Jamal comes across a glib talker capable of engaging the toughest of negotiators with a sumptuous doze of humor and levity, Kapur’s Ram is a no nonsense diplomat who appears to be a tough nut to crack. While essaying their respective parts the two thespians offer a great display of theatrics during the two hours of intense acting that encompasses an entire gamut of emotions. We all are aware of what a great thespian like Naseeruddin Shah is capable of doing on stage and yet as Jamaluddin Lutfullah he manages to surprise us time and again. Here is a highly complex character that Shah seems to have essayed so effortlessly. In other words, a lesser performer would have had nightmares matching what Shah achieves here with remarkable ease. On the other hand, Rajit Kapur delivers a brilliant performance that would easily feature amongst the very best in his career. The masterful manner in which Kapur modulates his voice at different junctures in the play is what makes the performance so special. Overall, A Walk in the Woods effectively highlights the inefficacy of any peace dialogue in the absence of mutual trust. It also reminds us of the constantly lurking threat of a nuclear war. The play avoids the classical blame-game approach to highlight the sorry state of Indo-Pak relations even after 70 years of partition and chooses to offer a more thoughtful and balanced view on the issue. This adds an element of objectivity to the play which immensely boosts its credibility and appeal. The top-notch performances of Shah and Kapur do great justice to the powerful material at hand. If you are a theatre enthusiast then you just cannot ignore A Walk in the Woods. As for the others, it can prove to be a great way of falling in love with the medium. Absolutely loved the performance yesterday, and agree with your assertions. Well enacted play which brings out many nuances of such dialogues. Though I'd add that the script seems to favour Pakistan a bit, which with help of Shah's performance makes it more lopsided. But the latter part was expected so blame should lies squarely with the script. I was surprised that even in his monologue filled with cynicism to the brim, he talks about the dismemberment of Pak, and the Indian side is almost apologetic about it. I don't think India has clean hand, but definitely Pakistan's administration is not in a position to browbeat us on such a point, especially with what happened in Kargil, or the state sponsorship of terror. How to write a good informative essay?